1975 Rod Ball Design Ski-tail Kneeboard 5 ft 7"
Fibreglassed foam blank, 1/8"stringer, spray decor, fin box, central legrope plug. Deck: rodney ball surf design, black text parallel to stringer..
Bottom: rodney ball surf design, black text parallel to stringer. Deck: Clear with four spayed colour blocks (purple, brown, orange, yellow) with black pinlines. Bottom: Clear with sprayed and black pinlined "split arrow", three toned panels offset right. Collected from Allan, West Pennant Hills NSW 8th April 2007. Allan had no information on the boards provinance. Some nose and tail damage, poorly repaired. Photographs and dimensions April 2007. 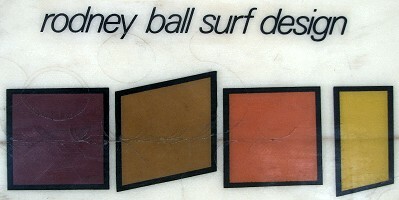 Rodney Ball started manufacturing boards as Rodney Ball Surf Design circa 1974 ? 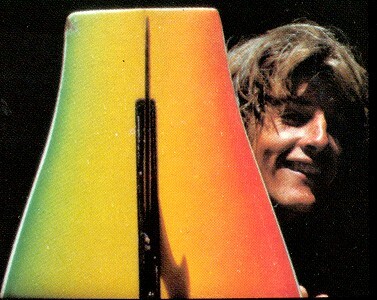 In 1976 he manufactured Clear Sea Surfboards, 1623 Pittwater Road Mona Vale NSW 2103. An early 1976 advertisment notes "My newest shape is probably my most radical -- I've called it the SKI." Surfing World Magazine, Volume 22 Number 4. January 1976. Page ?. Rodney Ball was an experienced snow skier who adapted some elements of snow-ski design into his surfboards. The central bottom slot, as seen on this board, was a feature of some contemporary ski designs. - reported by Mick Mock, in conversation. The unusal tail design was one extreme of the use of flyers (or wings) on the tail profile from about 1972 to enhance performance. In this case, note how the flutes continue the rail line, with the Ski tail an extension. 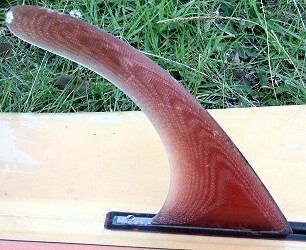 Terry Fitzgerald, in conjunction with Rod Ball, produced a similar tail design, initally called the Fanger, at Hot Buttered Surfboards, circa 1976. Fitzgerald later termed the design, the Screwdriver. "TF. 's INSIDE SUNSET FANGER 1"
TRACKS Magazine, January 1976 Number 64 Page 33. Ski Tail Design by Terry Fitzgerald, credits Rodney Ball. Surfing World Magazine, Volume 26 Number 4. Early 1978. Page 25. Surfing World Magazine, Volume 22 Number 4. January 1976. Page ? Web Page: My Paipo Boards and ...More. - page by Rod Rodgers, Baltimore Maryland. Ski-tails, or their now more popular name, screwdrivers, have evolved over a number of years, mainly due to the involvement of their designer, Rooney Ball, in the winter sport of snow skiing. These boards were designed with surfing good clean waves in mind, and this is where they do excel. Steve Zoeller adopted the ski-tail principles and incorporated them into his own boards. To allow them to handle Sydney surf, he gave them wider planshapes and extra tail rocker. 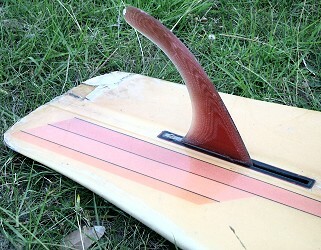 The reverse curves in the tail of the board pushes it in short arcs which, if the board were put in the right situation, on the right wave, would inevitably make the 3600 turn a distinct reality. The amount of push these boards do create during bottom turns and cutbacks is very noticeable, especially in waves with power. These boards are quite manoeuvrable as instead of turning off the tail of the board, you are turning off the beginning of the ski-tail. So, if the board is 5'8" in length and the length of the ski-tail is 10", in fact, you would be surfing a board with the looseness of a 4'10" board. My board is 5'10" in length, 20 1/2" wide with the ski-tail being 10"long and 8" wide. The rails are quite blocky, with a hard edge underneath. This edge provides drive in hard rail turns. Also, incorporated in the bottom design is a slight concave which gives the board lift, speed and the ability to draw long lines if necessary. As I have previously mentioned, these boards were designed with surfing good clean waves in mind. The board I have ridden for the last year is no exception -it went really well in the long walls of Queensland and its ability to sit in the tube was its most outstanding asset." "Ken Horton and Ski tail"